I checked in to BROOKLYNrehab yesterday. No, I don’t have a drinking problem - more likely a shopping addiction. BROOKLYNrehab is Alyssa Zygmunt’s clever collection of vintage finds on sale on etsy.com. Alyssa is an industrial designer turned fashion designer who fuels her passion for quirky collecting by scouring vintage stores around Brooklyn and beyond. These are some of her latest finds. Better check these out quickly because things have been selling fast lately. 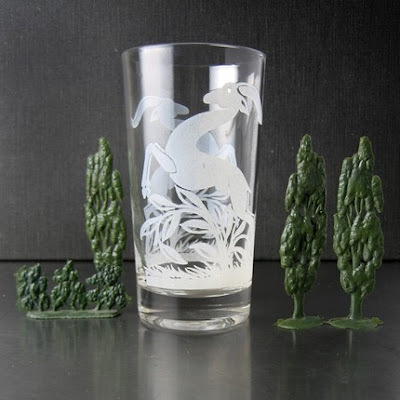 This etched antelope glass is only five bucks. Yep, you heard right, $5. 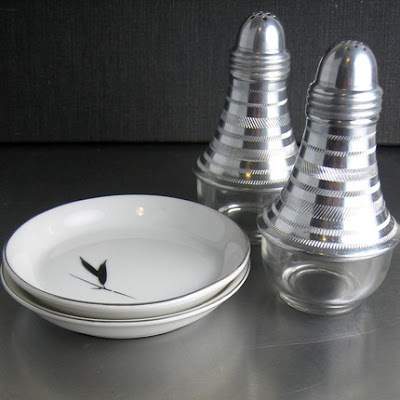 These 50s salt and pepper cellars and pair of small plates are sold as a set and are in perfect condition. "New York is full of secret spots containing lost treasures," says Alyssa. "You just have to be willing to look. 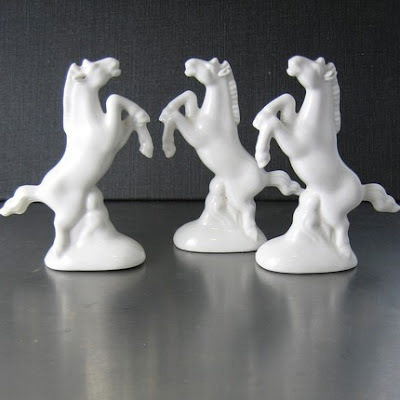 Sometimes the trip is a bust and other times you find a stampede of wild horses captured in ceramic." 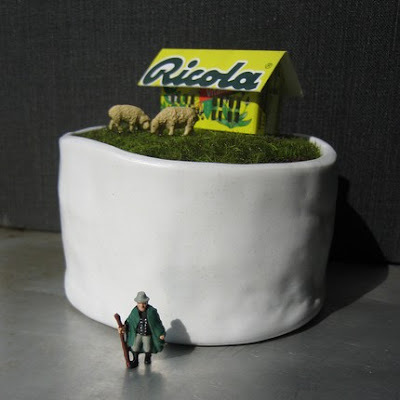 These miniature horses, made of slip cast porcelain glazed in a glossy white, go perfectly with the gnome, above. And there are others in her porcelain menagerie. Alyssa hunts for treasure at flea markets, library and school inventory sales, prop stores, and estate sales. She recommends Roulette on Havemeyer Street (see apartment therapy) and Ugly Luggage on Bedford Avenue (see New York magazine), both in Williamsburg. She often draws inspiration from the window displays at ABC Carpet and Home in Manhattan. 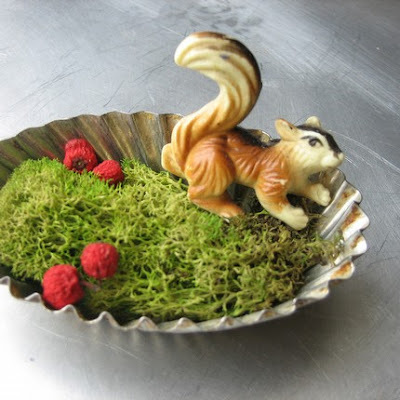 Then she comes up with whimsical vignettes such as these, below. 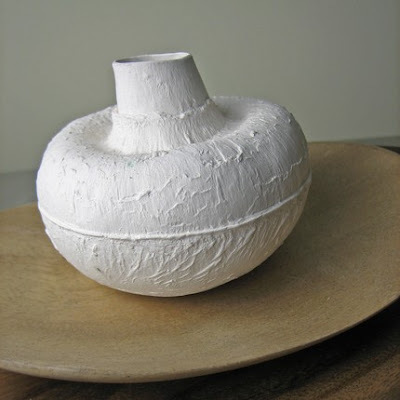 Besides having an eagle eye for reusable cast-offs, Alyssa is adept at making her own pieces and is currently experimenting with ceramics. 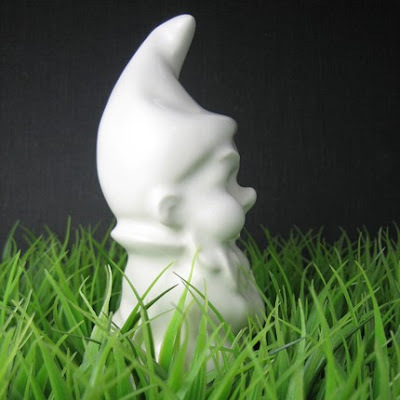 She originally made the porcelain gnome at the beginning of this post as table decorations for a friend's wedding. And now she has cast buttons made into rings and this magnificent mushroom, which can be used as a bud vase or a sculpture. I liked its combination of delicacy and earthiness so much that I snapped one up immediately. Like any good addict, I will be checking her etsy pages often for new arrivals. I love how she has styled the items. Absolutely beautiful. Takes a creative eye to pick out the pearls from the junk – and patience, too! Wonderful finds!